I walk into my daughter’s bedroom. She’s only three so there is still time before she slaps her favourite band, actor or a Moominvalley character poster on the wall. So far we have been doing all the writing. There is her name in nice red serif on one wall and a pale-pink “sleep tight, sweet dreams” next to her bed. I think she likes it. However, we didn’t write “we value you as an individual” or “we care about your wellbeing”. She wouldn’t get it. We wouldn’t write it. Who would? I used to work at a company. You might say I was engaged at a company. (How funny it means both to be busy or occupied and pledged to be married). Guess what? They had the list in their pocket. It had four values on it. People were supposed to aspire to be brave, decent, imaginative and supportive. Not a bad set you might say? I agree. I have certainly done my share of being brave, too brave at times 😉 I hope I was supportive.. and so on. There was also this one director who couldn’t care less to remember what people did or what their names were. A project manager who would report one status to the stakeholders and another to the team. Team leader who would rarely leave his desk or a senior developer who would jeopardise any attempts to use new bits of technology. There was also the appraisal system to evaluate your performance against a stale set of artificial objectives with a cap on how many people can score well. It was too painful to look at the bold and ambitious declarations and at the constant actions undermining them. Eventually I filed for a divorce. I have left. It turns out, others did too. Recently I’ve checked again. 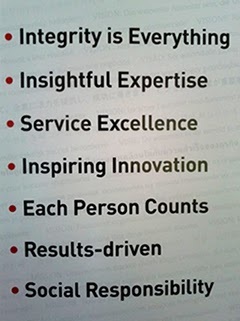 Now, this company has only three values: brave, imaginative and decent. Somehow begin supportive didn’t work out? Maybe it’s better that way. I agree, values work best when they are embodied in what we do: in our relations, in our decisions and attitude. We’re generally pretty good at picking up hints from around us, we notice quickly when colleagues are friendly towards each other, when managers trust their teams, when directors are honest. We do not need a map for that. To single out a set of values is perhaps too constraining is such case. Would it mean we don’t care about other values? Over to you Catila, so what’s wrong with these values?